In Firefly: The Game, players captain their own Firefly-class transport ship, traveling the ‘Verse with a handpicked crew of fighters, mechanics and other travelers. As a captain desperate for work, players are compelled to take on any job – so long as it pays. Double-dealing employers, heavy-handed Alliance patrols and marauding Reavers are all in a day’s work for a ship’s captain at the edge of the ‘Verse. 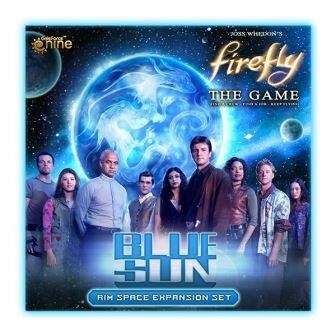 Firefly: The Game - Blue Sun expands the game with with new supply cards, Nav cards, and Jobs. Two additional Reaver Cutters and new rules put the 'Verse on high alert. Reaver activity is on the rise and your crew is on the menu! This is not a stand-alone product and requires Firefly: The Game to play.